Remember the pre-iPhone days when cell phones had buttons and you only touched that tiny black and white screen if you needed to clean it? Nokia used these little LCDs in their 3310 and 5110 cell phones. As technology changed, these displays finally found their new place in the world of DIY. 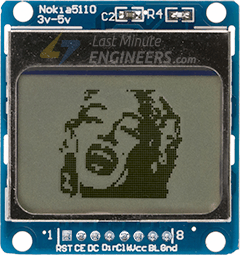 Soon they became popular among hobbyists as these displays are small(only about 1.5″), inexpensive, easy to use, fairly low power and can display text as well as bitmaps. At the heart of the module is a powerful single-chip low power CMOS LCD driver controller from Philips – PCD8544. The chip is designed to drive a graphic display of 84×48 pixels. It interfaces to microcontrollers through a serial bus interface similar to SPI. Thanks to the PCD8544 controller’s versatility, it includes on-chip generation of LCD supply and bias voltages which results in low power consumption making it suitable for power sensitive applications. In a normal state, the LCD consumes as low as 6 to 7mA only. As per datasheet, this chip operates in the range of 2.7 to 3.3 V and has 3v communication levels. So, for any 5V logic microcontroller like Arduino, some sort of logic level shifting is required (otherwise display may get damaged). For more information about PCD8544 CMOS LCD controller, check out this datasheet. The LCD also comes with a backlight in different colors viz. Red, Green, Blue & White. The backlight is nothing but four LEDs spaced around the edges of the display. If you want to change the backlight of the LCD, just remove the LCD off the board by pushing the metal clips at the back side. When the screen comes off, you will notice the four LEDs soldered around the edges of the display. Just replace the LEDs with desired color LEDs. There are many versions of these LCD displays that don’t come with any current limiting resistor. This means you have to be careful while connecting power supply to it. As a precautionary measure, you can place a 330Ω current limiting resistor in series with the ‘Backlight’ pin. The whole memory map with banks, segments and data is highlighted below. Each bit represents particular pixel on the screen which can be turned ON or OFF programmatically. RST pin resets the display. It’s an active low pin meaning; you can reset the display by pulling it low. You can also connect this pin to the Arduino reset so that it will reset the screen automatically. CE(Chip Enable) pin is used to select one of many connected devices sharing same SPI bus. It’s an active low pin as well. D/C(Data/Command) pin tells the display whether the data it’s receiving is a command or displayable data. DIN is a serial data pin for SPI interface. CLK is a serial clock pin for SPI interface. VCC pin supplies power for the LCD which we connect to the 3.3V volts pin on the Arduino. BL(Backlight) pin controls the backlight of the display. To control its brightness, you can add a potentiometer or connect this pin to any PWM-capable Arduino pin. Connections are fairly simple. As we are implementing software SPI, we have flexible pin options. You can connect data transmission pins to any digital I/O pin. In our case the serial clock(CLK), serial data(DIN), data/command(DC), chip enable(CE) and reset(RST) pins are connected from pin 7 all the down to pin 3 on Arduino. But unfortunately, the LCD has 3v communication levels, so we cannot directly connect these pins to the Arduino. We need some protection. This can be done by shifting levels. One of the cheap and easiest way to shift levels is to add resistors inline with each data transmission pin. Just add 10kΩ resistors between the CLK, DIN, D/C, and RST pins and a 1kΩ resistor between CE. Finally, The backlight(BL) pin is connected to 3.3V via 330Ω current limiting resistor. 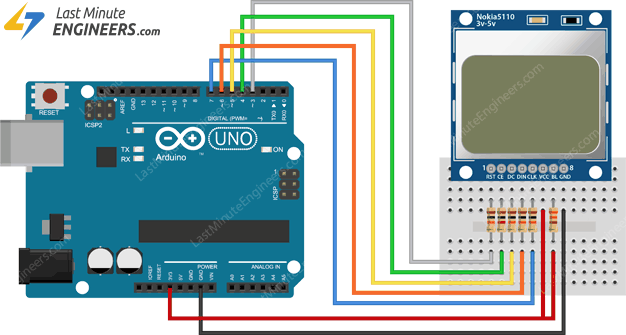 You can add a potentiometer or connect this pin to any PWM-capable Arduino pin, if you wish to control its brightness. The PCD8544 LCD controller has flexible yet complex drivers. Vast knowledge on memory addressing is required in order to use the PCD8544 controller. 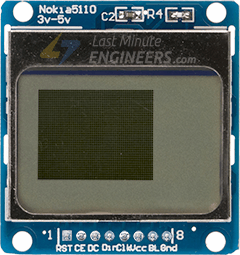 Fortunately, Adafruit’s PCD8544 Nokia 5110 LCD library was written to hide away all the complexities so that we can issue simple commands to control the display. Filter your search by typing ‘nokia’. There should be a couple entries. 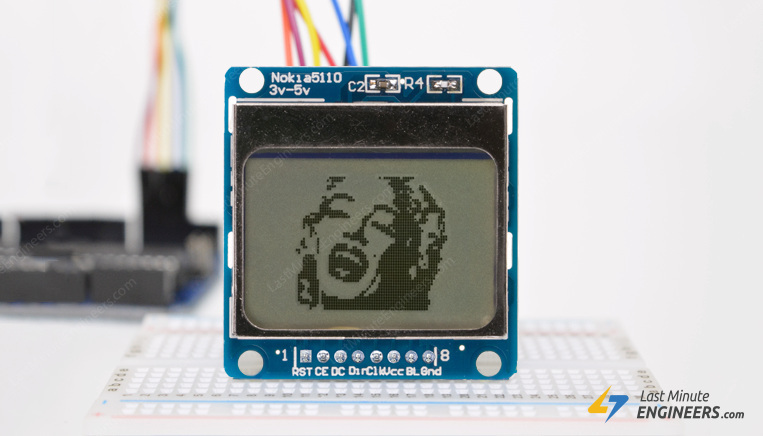 Look for Adafruit PCD8544 Nokia 5110 LCD library. Click on that entry, and then select Install. This library is a hardware-specific library which handles lower-level functions. It needs to be paired with Adafruit GFX Library to display graphics primitives like points, lines, circles, rectangles etc. Install this library as well. Although the PCD8544 has a built-in GDDRAM for the screen, we cannot read the contents of it. Therefore, it is not possible to manipulate the screen buffer to perform mathematical operations. As an alternative, the library allocates 504 bytes of memory from ATmega328P as buffer. So, it can manipulate the screen buffer and then perform a bulk transfer from the ATmega328P’s memory to the internal memory of the PCD8544 controller. 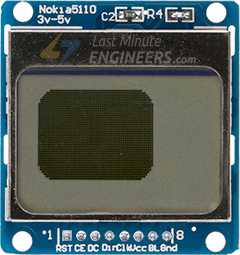 This will give you complete understanding about how to use the Nokia 5110 LCD display and can serve as the basis for more practical experiments and projects. Try the sketch out and then we will dissect it in some detail. // you can change the contrast around to adapt the display for the best viewing! display.setRotation(rotatetext);  // rotate 90 degrees counter clockwise, can also use values of 2 and 3 to go further. The sketch starts by including three libraries viz. 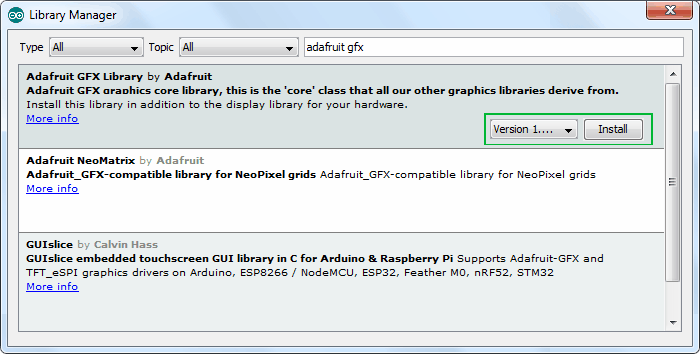 SPI.h, Adafruit_GFX.h and Adafruit_PCD8544.h. Next, we need to create an LCD object. 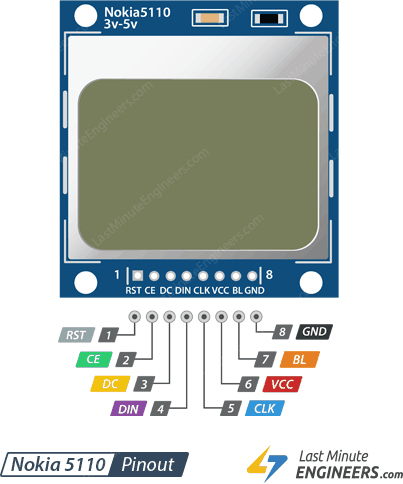 This object takes 5 parameters and specifies which Arduino pins are connected to the LCD’s CLK, Din, D/C, CE and RST pin. We also defined rotatetext variable which will make sense a little later. In setup function: we need to initialize the LCD object using begin() function. We also need to set the contrast of the display using setContrast(value) function with value can be anywhere between 0-100. However, value between 50-60 gives great results. Next, we need to set the font color by calling function setTextColor(). Pass parameter BLACK for the dark background and pass WHITE for bright background. Now before printing the message we need to set the cursor position by calling function setCursor(X,Y). Pixels on the screen are addressed by their horizontal (X) and vertical (Y) coordinates. The coordinate system places the origin (0,0) at the top left corner, with positive X increasing to the right and positive Y increasing downward. We can use simple print(" ") or println(" ") function to print the message on the screen just like we print data on serial monitor. Remember, println() will move the cursor to the new line. In order for the library to perform extremely fast mathematical operations on the screen buffer (more than 100 frames per second), calls to the print functions do not immediately transfer the contents of screen buffer to the PCD8544 controller. A display() command is required to instruct the library to perform the bulk transfer from the screen buffer in the ATmega328P to the internal memory of the PCD8544 controller. As soon as the memory is being transferred, the pixels corresponding to the screen buffer will show up on the LCD display. Characters are rendered in the ratio of 5:7. Meaning, passing font size 1 will render the text at 5×7 pixels per character; passing 2 will render the text at 10×14 pixels per character and so on. Numbers can be displayed on the LCD display by just calling print() or println() function. An overloaded implementation of these functions accepts 32-bit unsigned int, so you can only display numbers from 0 to 4,294,967,295. 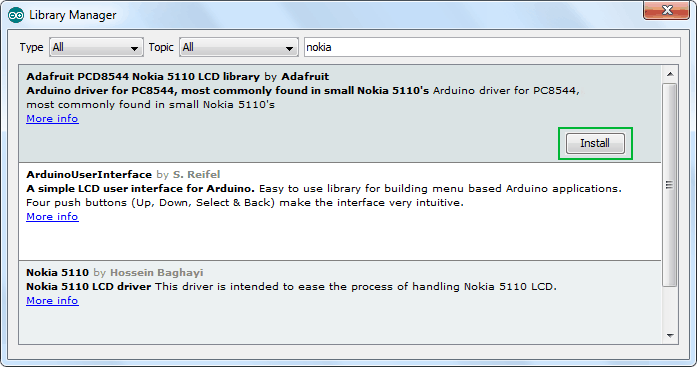 You can rotate the contents of the display by calling setRotation() function. It allows you to view your display in portrait mode, or flip it upside down. 0 – Keeps the screen to the standard landscape orientation. 1 – Rotates the screen 90° to the right. 2 – Flips the screen upside down. 3 – Rotates the screen 90° to the left. 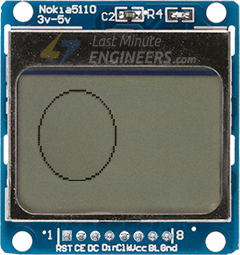 This last example shows how to draw bitmap images to the Nokia 5110 LCD Display. This is useful for creating splash screens of company logos, making sprites or just creating fun graphics for displaying information. 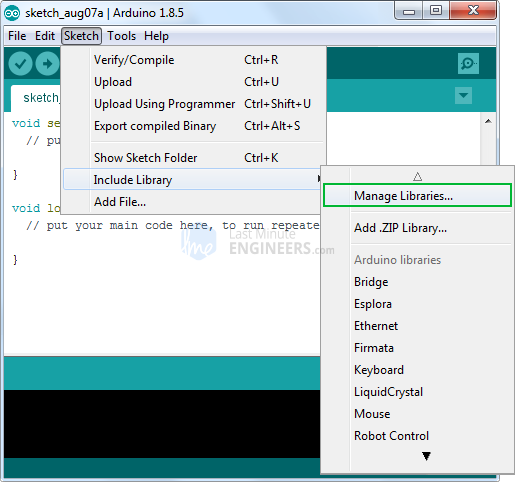 Copy the following code, paste it into the Arduino IDE and click upload. 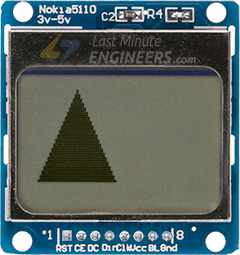 To show bitmap image on the Nokia 5110 LCD display we need to call drawBitmap() function. It takes six parameters viz. Top left corner X coordinate, top left corner Y coordinate, byte array of monochrome bitmap, width of bitmap in pixels, height of bitmap in pixels and Color. In our example, the bitmap image is 84×48 in size. So, X & Y coordinates are set to 0 while width & height is set to 84 & 48. But, before we can call the drawBitmap() function, we first need an image to draw. 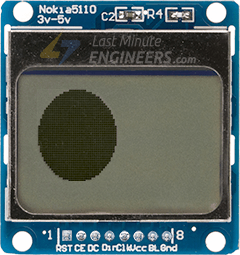 Remember, the screen resolution of Nokia 5110 LCD display is 84×48 pixels, so images larger than that will not display correctly. To get a correctly sized image, you can use your favorite drawing programs like Inkscape, Photoshop, Paint, etc., setting the canvas size to 84×48 pixels. 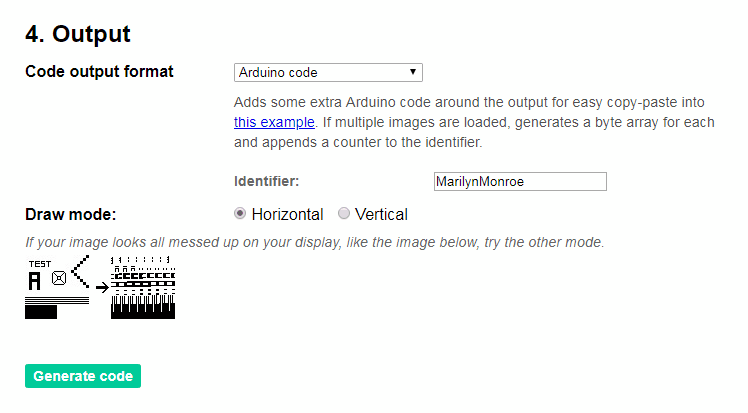 We took laughing Marilyn Monroe image as an example and converted into 84×48 pixels using Paint and saved as .bmp. 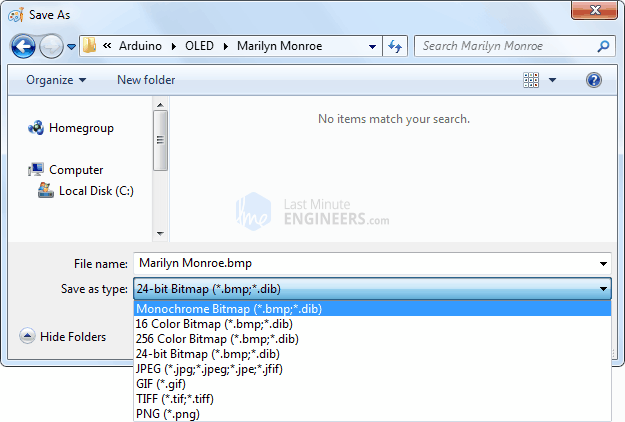 Once you have a bitmap, it’s time to convert it into an array that the PCD8544 controller can understand. This can be done using two ways: Online method using image2cpp and Offline method using LCD Assistant. To begin with, open image2cpp in your browser and select any image you want to display on the screen. The dimensions of your image will populate in Canvas size option under Image settings. If you have selected bigger image than 84×48, change it to 84×48 and select proper Scaling option. You can view the output in Preview section. 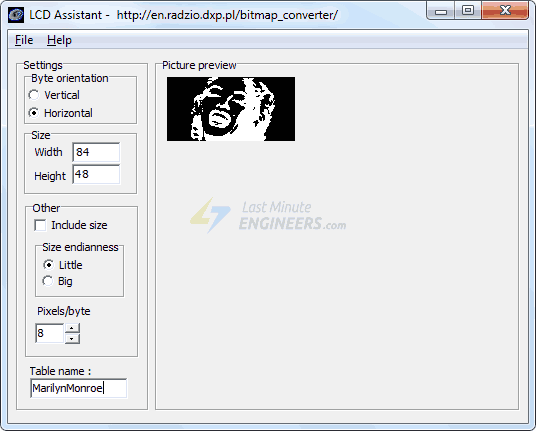 There’s another application called LCD assistant – http://en.radzio.dxp.pl/bitmap_converter/which can convert your bitmap image into data array. It’s not as powerful as image2cpp but still popular among hobbyists. To start with, you need to convert you image into 84×48 1-bit monochrome bitmap. You can use your favorite drawing programs like Inkscape, Photoshop, Paint, etc. to do it, just like we did in MS paint. Open your file in MS Paint and resize it to 84×48. That’s it. With your array created, paste it into your code. Just be sure to name it appropriately. Then call your array inside the drawBitmap() function.